When it comes to free-improvisation you most likely don’t need more than the surnames of French double bass master Joëlle Léandre and British vocal master Phil Minton. The front cover of their first-ever recorded duo betrays no other information besides the surname and an incidental photo of sky. Léandre and Minton were captured playing live in Paris in October 2016. The inside cover quotes influential Dadaist poet, essayist and performance artist Tristan Tzara's (1896-1963) poem L’homme approximatif, chant VI. And, indeed, this live recording - as can be seen in the attached you-tube video - radiates a similar anarchist spirit, one that defies all conventions and conceptions. The recording is divided into three, koan-like titles, the 32-minutes “Si,lence” and the shorter “is” and “blu,ish”. “Si,lence” brings together the hyperactive, trains of thoughts, associations and ideas of Léandre and Minton. Both are wandering through abstract, free-associative textures, chatting and sharing obscene secrets in undecipherable languages, losing their minds and way in colorful-psychedelic labyrinths and sudden rhythms and totally enjoying this close, busy improvisation. Léandre's associative operatic-conversational-vocalizations are answered beautifully by Minton and both sound as not only as master improvisers but also as experienced performance artists-actors who know how to win bemused audiences with their nuanced weird stories and their unique physical performances. Minton opens the following, short “is” with suggestive bird calls, whistling and singing fragmented melodies. Léandre's surprisingly economic and disciplined playing puts some order to his ornithological stream of vocalizations, but eventually joins Minton's playful attempt to lure as many birds as possible to their stage. 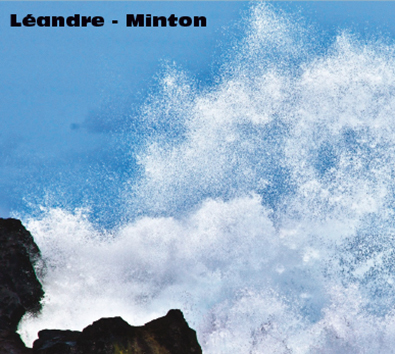 “bluish” proves again and again that Léandre and Minton play as inseparable twins, communicating instantly and telepathically. Both transform any idea, strange and bizarre as it may, into a colorful, ecstatic operatic act, and this one even ends with few symbolic snores.